Search for all "6xHistidine Epitope Tag"
Mouse anti 6xHistidine Epitope Tag AD1.1.10. Product is tested for Frozen Sections, Enzyme Immunoassay, Immunoprecipitation, Western blot / Immunoblot. PAX6 transcription factor linked to Histidine tag. Western blot (1/500-1/1000): This antibody is routinely tested on Histidine tagged recombinant protein. Papadaki A, Politou AS, Smirlis D, Kotini MP, Kourou K, Papamarcaki T, et al. The Leishmania donovani histidine acid ecto-phosphatase LdMAcP: insight into its structure and function. Biochem J. 2015 Feb 19. PubMed PMID: 25695743. Els Conrath K, Lauwereys M, Wyns L, Muyldermans S. Camel single-domain antibodies as modular building units in bispecific and bivalent antibody constructs. J Biol Chem. 2001 Mar 9;276(10):7346-50. Epub 2000 Oct 25. PubMed PMID: 11053416. Bahi A, Boyer F, Kafri T, Dreyer JL. CD81-induced behavioural changes during chronic cocaine administration: in vivo gene delivery with regulatable lentivirus. Eur J Neurosci. 2004 Mar;19(6):1621-33. PubMed PMID: 15066158. Hoffmann SC, Schellack C, Textor S, Konold S, Schmitz D, Cerwenka A, et al. Identification of CLEC12B, an inhibitory receptor on myeloid cells. J Biol Chem. 2007 Aug 3;282(31):22370-5. Epub 2007 Jun 11. PubMed PMID: 17562706. Bahi A, Dreyer JL. Overexpression of plasminogen activators in the nucleus accumbens enhances cocaine-, amphetamine- and morphine-induced reward and behavioral sensitization. Genes Brain Behav. 2008 Mar;7(2):244-56. Epub 2007 Aug 3. PubMed PMID: 17680802. Bahi A, Kusnecov A, Dreyer JL. The role of tissue-type plasminogen activator system in amphetamine-induced conditional place preference extinction and reinstatement. Neuropsychopharmacology. 2008 Oct;33(11):2726-34. doi: 10.1038/sj.npp.1301668. Epub 2008 Feb 6. PubMed PMID: 18256596. De Vooght, L. et al. (2012) Expression and extracellular release of a functional anti-trypanosome Nanobody® in Sodalis glossinidius, a bacterial symbiont of the tsetse fly. Microb Cell Fact. 11: 23. 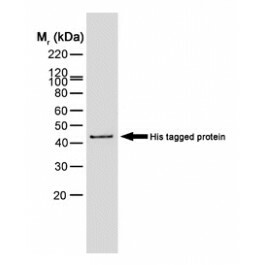 This antibody recognises proteins containing the motif H-H-H-H-H-H and is therefore of value in detecting proteins containing histidine tags. The antibody may be used to track the purification of proteins expressed in bacteria, yeast or insect cells. 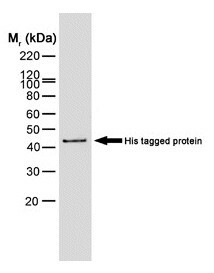 It reacts against all His tagged proteins so far tested. In Western blotting of bacterial extracts the antibody has been shown not to cross-react with any endogenous products, although some cross-reactivity may be seen with extracts of insect or mammalian cells. We recommend the use of SM1693P for this application.